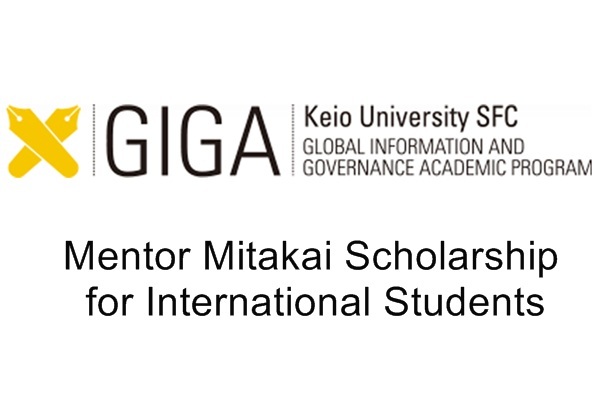 The Keio University Japan offers GIGA Mentor Mitakai scholarship made possible through the generosity of Mentor Mitakai, one of the alumni associations of Keio University. This scholarship is for International Students who have been admitted to the Faculty of Policy Management or the Faculty of Environment and Information Studies. The Mentor Mitakai Scholarship is available for Students who show exceptional academic excellence only. The aim of the scholarship is to support hard working students who have excellent academic records, show a strong desire and interest to pursue advanced information technology and policy at the Faculty of Policy Management or Faculty of Environment and Information Studies at Keio University, and are likely to contribute to the global society using their acquired knowledge and skill in the future. This scholarship is available for 4 students for one year and will cover Admission Fee & Academic Fees. The scholarship recipient will be exempt from payment of the admission fee and academic fees for one year starting September of the current year. The scholarship and supplement may be renewed up to four years, subject to annual review. Students who show exceptional academic excellence only will get Merit Scholarship Supplement JPY 1,200,000 per year. Persons who hold any of the Japanese residency statuses such as Permanent Resident, Special Permanent Resident, Spouse or Child of Japanese National, Spouse or Child of Permanent Resident, or Long Term Resident are NOT eligible to receive scholarship. Screening of application documents submitted for the Admissions for Overseas Students (GIGA Program). Renewals of grants are considered on the basis of achievements from the previous year. Those seeking a renewal must submit a renewal application, accompanied by a recipient report and transcripts for the current year, by the deadline stipulated by the university; and attend a personal interview with members of the Scholarship Committee. Renewal procedures are announced in July of the following year. Students decide to apply to the scholarships may register from the Admission Web Entry System of Admissions for Overseas Students (GIGA Program). Application Documents to be Submitted by Postal Mail” must reach the office by the last date. A Notification of Award will be sent out to the students selected as scholarship recipients by postal mail, together with admission registration documents in early April. The scholarship recipient may be requested by the scholarship donor for attendance at related meetings or social events to the extent that they do not interfere with studies.